Connectivity between place and purpose, art and inspiration: Sarah King has tapped into this frequency. Devoted to living life where Nature still reigns as queen, in Tofino on Vancouver Island, Sarah consistently finds ways to enjoy waves and powder with friends. But she also succeeds in rendering the beauty she discovers in her section of the great Northwest. 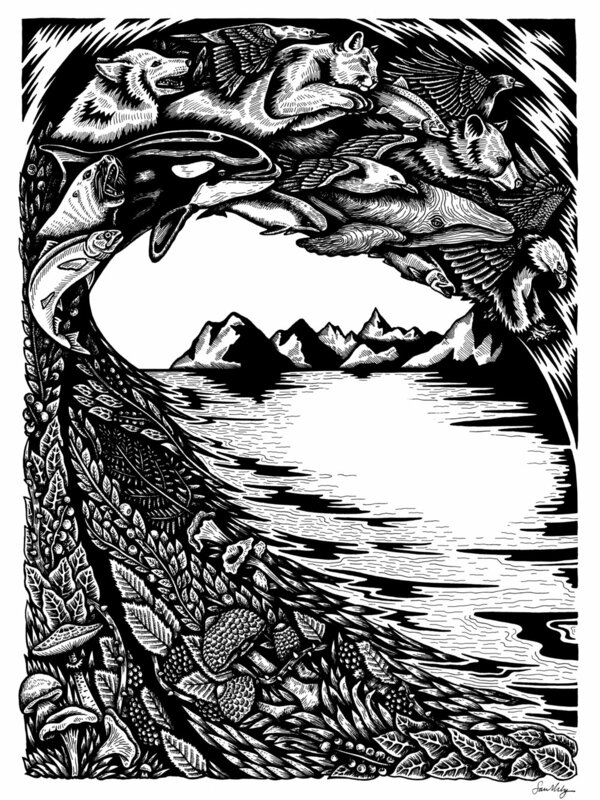 The ocean, mountains, forests and rivers of her territory, not to mention the eagles and whales and other wildlife that reside there, all mesmerize Sarah’s creative mind. And, by extension, our own lucky eyes. Sarah’s work draws energy and devotion from the powerful environment that surrounds her. Waves become wrapping canvases of lines that transition into clouds, while animals and plants native to her area morph from one to the next, as if representing a singular spirit. Her canvases include wood, surfboard fins, and snowboards. (Sarah has designed the board graphics for Jamie Anderson’s Gnu pro model for eight straight years.) Environmental causes also benefit from her talented hand, as does the B4BC (Boarding For Breast Cancer) Foundation. When asked how time spent in Nature affects her work, Sarah responds: “It definitely gets the creativity flowing. Finding the right balance is important, which is much easier said than done when the waves are good or it’s snowing in the mountains.” Art, Earth, and sideways sliding coalesce into one in Sarah’s world, culminating in an evocation of the Pacific Northwest’s natural supremacy.